Install the module and place it on a page in a DotNetNuke site. Click the Edit Menu Items link. 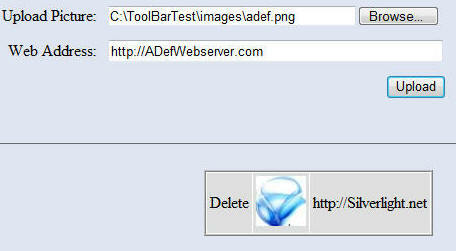 Add images and indicate the web address to navigate to when the image is clicked on. The image will be automatically resized (for best results use an image that is 50x50 pixels). On the Settings page the number of buttons to show at a time can be set. 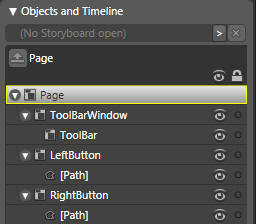 The toolbar will automatically resize and display navigation arrows as needed. The toolbar is composed of a Toolbar and a Box. 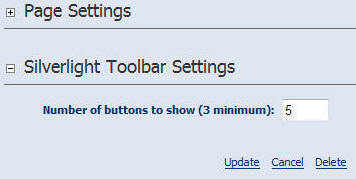 The Box is simply placed in the toolbar multiple times to create the elements on the Toolbar. The graphic above shows the files in the project. The Silverlight portion of the application is primarily composed of Page.xaml that contains the toolbar and Box.xaml that contains the element used to represent the menu items. The graphic above shows the outline of the elements. The Box.xaml file is simply an image with a reflected image below it. This file is also easily editable in Expression Blend. After a button is pressed, scrollPosition is calculated. The animation destination value (animation.To) is set to the current scrollPosition and the storyboard is triggered to run the animation. What if they don't have Silverlight installed? This tutorial demonstrates how you can show default module content when a visitor does not have Silverlight. <asp:DataList ID="DataList1" runat="server" RepeatColumns="5" RepeatDirection="Horizontal"
We have simply created a DataList that we will bind to the same data source that is populating the Silverlight toolbar. A left and right button are placed on either side. All three elements are wrapped in a ASP.NET table. An ASP.NET table is used rather than a normal table because it's width is easily adjusted programmatically based on the number of elements that are to be shown. In addition, hidden labels to track the number of pages and the current page are placed on the form. ShowNonSilverlightToolbar - This method calls the same "Edit_DAL.GetPictures(ModuleId)" method that the Silverlight toolbar uses to retrieve the pictures and urls's used for this instance of the module. It places the results in a PagedDataSource control and then binds the PagedDataSource to the DataList. ltbtn_Click and rtbtn_Click - Are methods attached to the navigation buttons. Add the following global variable below "int NumberOfButonsToShow;"
This code registers the Silverlight detection script and then triggers the script by filling the Literal control with a call to the ShowHideSilverlight method. 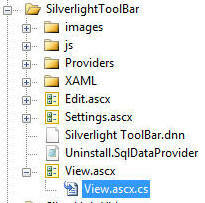 The code also sets the width of the table containing the non-Silverlight toolbar. 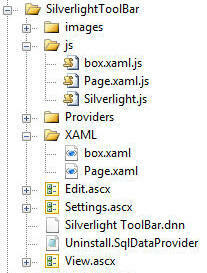 Finally it calls the ShowNonSilverlightToolbar method when the page first loads. 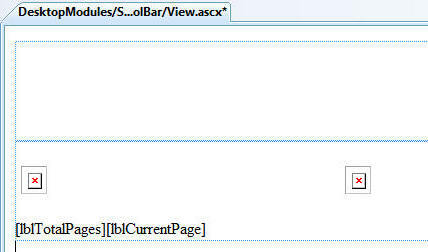 Save the page and from the Visual Studio toolbar select Build, then Build Page. The page should build without errors. When you view the page on a computer that does not have Silverlight installed you will see the non-Silverlight toolbar.